Our farm and malting operation is based at Cambria Vines N' Bines on Lower Mountain Rd., Cambria NY. We aim to produce high quality, sustainably grown ingredients for craft brewers and distillers. 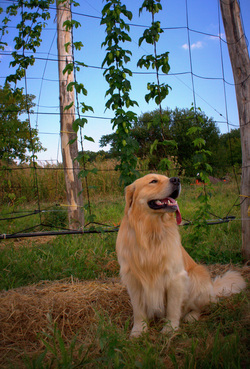 We currently have approximately 1.5 acres of hops planted and have been using organic practices for future certification. Our on-site malting facility was constructed with carbon-neutral concrete and uses 100% renewable energy for all electricity needs with some produced onsite with 2018 installed solar. We are ecologists by training, who care deeply about our impact on the Earth. We recognize that the decisions that we make as farmers impact our long-term use of the land, soil health and water quality; our agricultural practices are chosen to protect our resources. To complete the loop, our barley nibs and undersized grain feed the chickens and hogs at Gormley Farms in Wilson, NY.